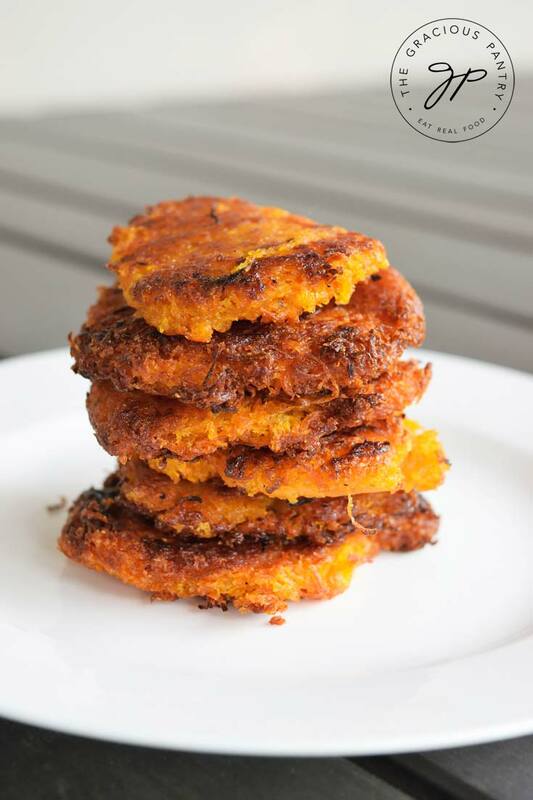 These clean eating sweet potato mini hash browns are the perfect compromise between what you want and what’s good for you! Mini chef has been going through a phase lately where he’s been pretty particular about breakfast. Normally, he loves a green smoothie in the morning, and I’m more than happy to oblige. But every so often he gets a little tired of the same thing every morning (can’t blame him), and he starts to complain about how he wants something else. He’s gotten tired of eggs for breakfast as well, even if I sweeten the deal with a little sausage or bacon. I know he loves hash browns (he will NEVER turn down hash browns…) but I hate giving him fried, white potatoes first thing in the morning. It’s just fat and sugar hitting his blood stream right before he starts his school day. Doesn’t seem fair to do that to the kid, so I’ve started meeting him half way with these sweet potato mini hash browns. He loves them and I love that he’s getting a bit more nutrition out of his first meal of the day. After all, he skipped a grade this year, so I have to keep that kid’s brain in tip-top working order so he can keep up! I have served these with an over-medium egg for protein and he really enjoyed it. So if hash browns are your thing, this might be the compromise you’ve been waiting for! Want something a little different for breakfast? 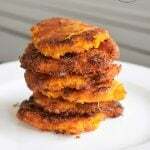 These delicious sweet potato hash browns are a delicious start to your day! Peel your sweet potato, and then grate it on a fine grater. These shreds need to be small so this will cook properly. Transfer all the grated sweet potato to a cheesecloth and wring out as much of the liquid as you can. Hash browns fall apart during cooking if the potatoes have too much liquid. You'd be surprised how much liquid is in a sweet potato! So squeeze hard! Once the shreds are dry, put them into a medium mixing bowl, add the spices and form your patties. I got about 6 out of mine and they are about 2 inches in diameter. Place the patties into a skillet with oil and cook on each side until each side is brown. Please note that the nutrition data below is a ballpark figure. Exact data is not possible. Data does NOT include cooking oil. Love the idea ! My son also tired of (almost) the same stuff every morning. Thank you so much ! Will they refrigerate well if prepared the night before and cooked the following morning? Erin – It should be okay, yes. hi! i would just like to know approximately how many grams the large sweet potato should be? Clarice – Thanks for catching that! I just updated the recipe. It’s approximately 1 lb or 454g, give or take. It doesn’t have to be totally exact. Hope you enjoy it!